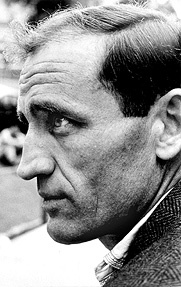 LARRY KEENAN PHOTOS OF NEAL CASSADY AND KEN KESEY IN OAKLAND CA. While waiting for Ken Kesey to arrive, Cassady kept a lookout for the cops. 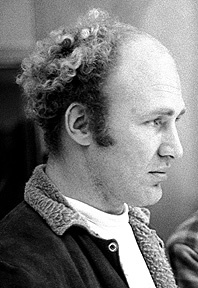 Kesey was a fugitive at the time. Cassady asked me, “What’s the heat like around here, man?” Thinking he was talking about the weather, I said, “Pretty nice.” He gave me the weirdest look, then I knew what he meant. Fugitive Ken Kesey was giving a talk to some students at the California College of Arts and Crafts when I shot this picture. I sent Neal Cassady some prints. The FBI intercepted Cassady’s mail, found this photograph and put it on a wanted poster. 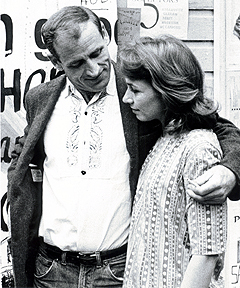 It was the only current profile they had of Kesey. Gypsy was a Hell’s Angel from Colorado, where he said he knew Dylan. 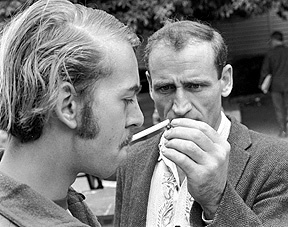 Neal Cassady is lighting Gypsy’s cigarette from his, in this photograph. Both of them were talking in ‘con talk’ most of the time. Neal asks Gypsy “Hey, have you got any animals, man?” Gypsy replies that he doesn’t have any animals. Later, I asked Gypsy what Cassady asked him for and he said that Neal wanted some Camel cigarettes.